After many years of SharePoint as blogging platform, I decided to move to WordPress. There are several reasons for the decision. One would be that I want to get rid of my server at home. 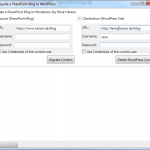 Another is SharePoint and its blogging capabilities. As you probably know, I’ve worked on the CKS:EBE (Community Kit for SharePoint – Enhanced Blog Edition) blogging extension for SharePoint blogs some years ago. It is awesome to see that the default blog can be extended to such an extend. I’ve even made it compatible with SharePoint 2013. WordPress offers far more functionality with so many Plugins and Themes available. The migration process needed to respect all posts, comments, attachments/linked files and links. There was no tool that matches the requirements. So I developed my own. I will post other articles and the sourcecode later. Here is a small teaser of the WPF GUI, I put over the former console application. 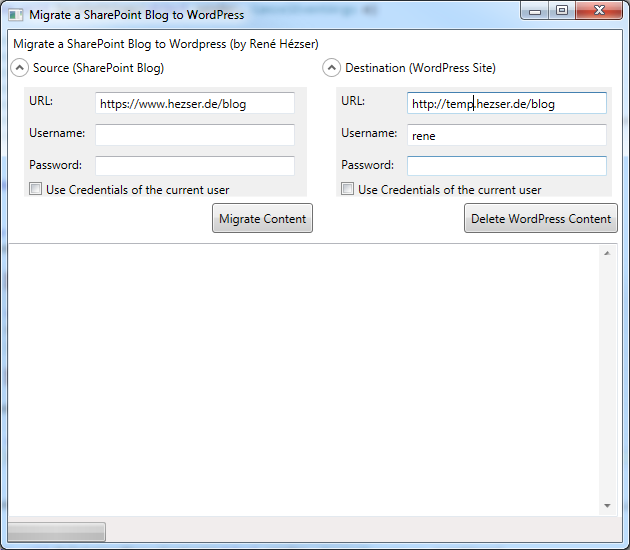 Since the URL changed from https://www.hezser.de/blog/archive/2014/09/05/tfs-migration-from-on-premise-to-visual-studio-online.aspx to https://www.hezser.de/blog/2014/09/05/tfs-migration-from-on-premise-to-visual-studio-online, I had to think about redirection. Fortunately I am not the first person with the problem. The WordPress Plugin “Redirection” from John Godley does all that for me. The Regex “/blog/archive/(\d*)/(\d*)/(\d*)/(. *).aspx” matches old URLs and will redirect to “/blog/$1/$2/$3/$4”. A couple of other plugins provide similar functionality. but we didn’t not see any detailed information on how to get it to work. We tried the installation guide method but it failed to fully install on the SharePoint server and we do not see the CKS blog web part even though we were able to activate it. Any help or thoughts on this would be greatly appreciated!